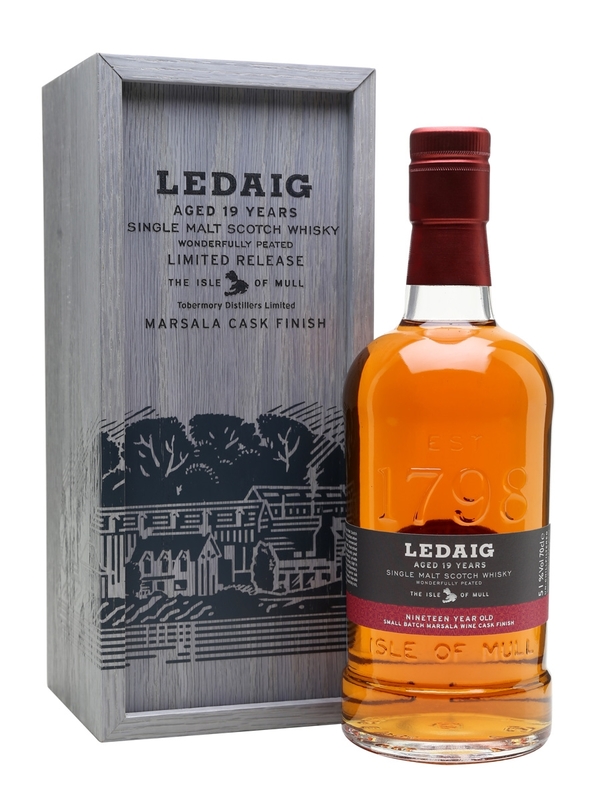 While Tobermory Distillery is closed for renovations lets have a look at Ledaig 19 Year Old Marsala finish. It was distilled back in 1997 and then matured in bourbon barrels and then finished in Marsala wine casks. It was bottled late 2016 before arriving to markets at the beginning of 2017. I delayed (a lot!) with this review since they whisky was pretty harsh whisky when I initially tasted it but I believed it will be much better with oxidation. So it sat aside and waited for the right time that finally arrived. Nose: Sweet and spicy wine, dry wine tannins, funky herbal and acrid peat, salt, some ashes as well, baked sour red fruit, berries, fresh rich malt and vanilla lurks below the surface, Over time and oxidation getting richer with softer ashes and peat smoke. Palate: Soft peat, intense smoky flavour with pepper and nutmeg, gentle red fruit sweetness, toffee, semi dry wine, ending with gentle white pepper and oak spices. Finish: Medium length, lingering spices, pepper, tannins, rich, sweet citrus fruit. Thoughts: This is not a beginners whisky. When I opened it at first it was way harsh and tough. A few months later with oxidation helped mellowing it and the result is a very good and complex whisky. Remember – give it a lot of time to open up and you will be rewarded. This entry was posted in Whisky Reviews and tagged Ledaig on September 12, 2017 by Yoav @ Whisky Gospel.